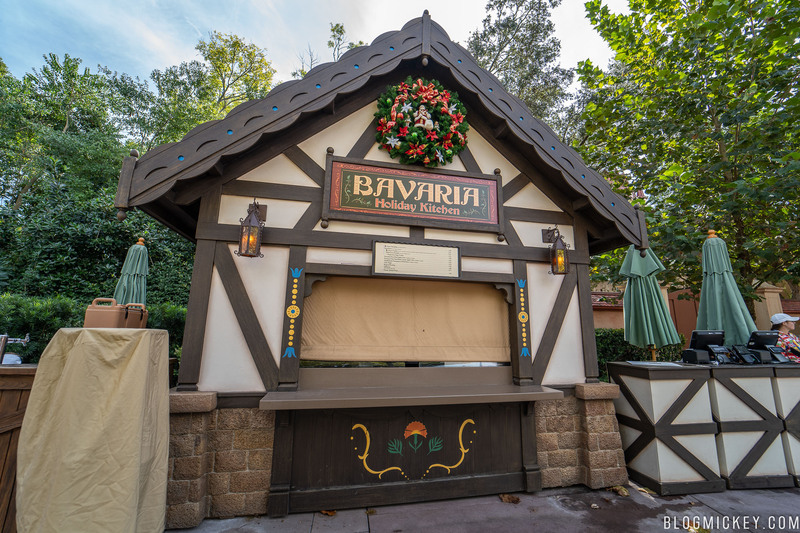 We continue our 2018 Epcot International Festival of the Holidays reviews with the Bavaria Holiday Kitchen in Germany. We start our Bavarian adventure with the potato dumpling with mushroom sauce. Actually, calling it just a sauce would be underselling it, there are big slices of mushroom piled into our cardboard bowl. Let’s start with the texture, it’s not like a regular potato, but rather a soft, almost sponge-like consistency. All of my research into the matter suggests that this is a traditional way to prepare Klöße in Germany. I think on texture alone, this earns a pass from me. That said, the mushroom sauce was excellent. 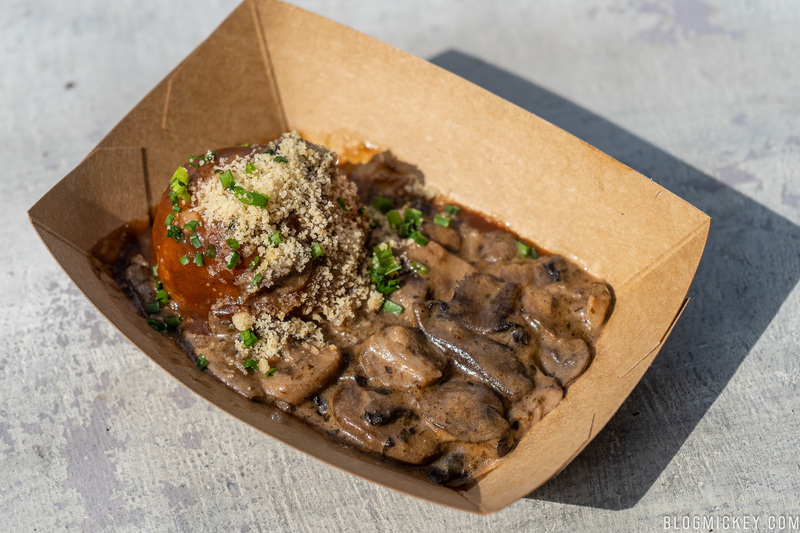 If you are used to a traditional German potato dumpling (that is spongy and bland), the mushroom sauce is just good enough to save the dish. If, however, you’re like 98% of the people reading this and you’re not familiar with the German take on the potato dumpling, you’d be wise to skip this dish. Sauerbraten, or “sour roast” from sauer for “sour” or “pickled” and Braten for “roast meat”, is exactly that, a pot roast. It comes with red cabbage and Spatzle. 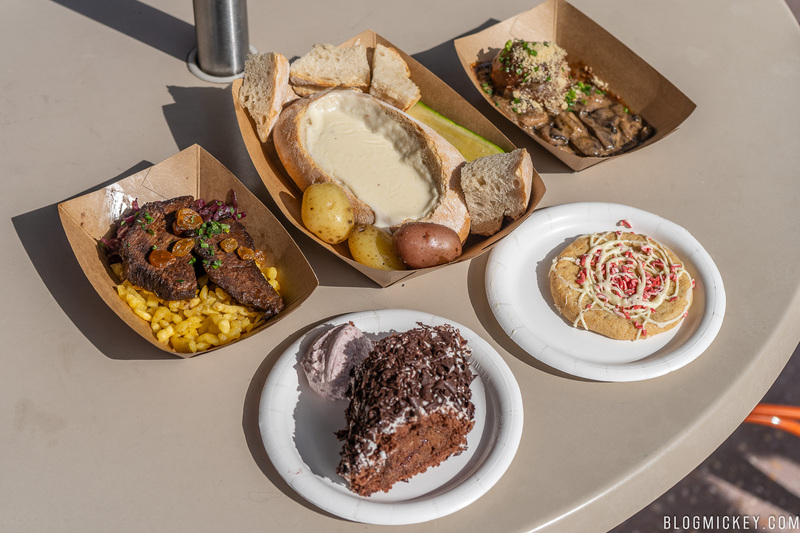 The portion size is good, the accompaniments fill out the dish and the flavors work well. The only drawback was how dry our Sauerbraten was. I hope it was just a case of us getting the last of a batch, and not the proper way to present the dish. 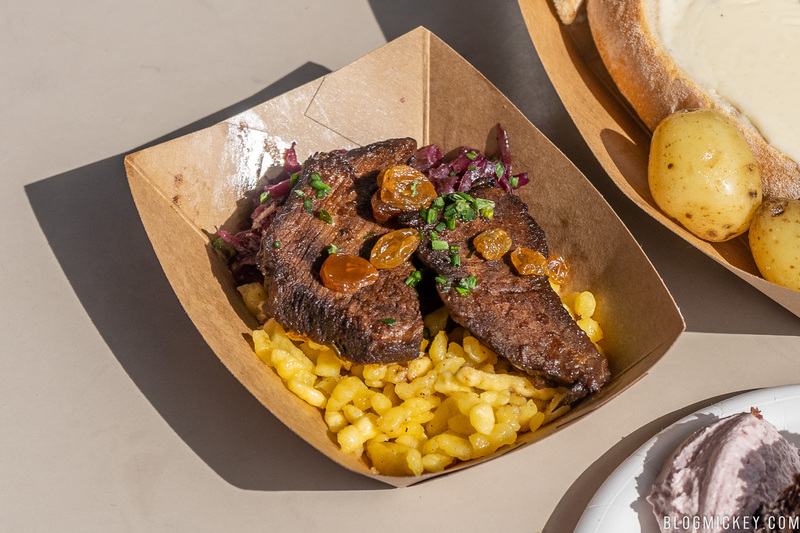 This is another dish that we want to keep an eye on throughout the festival to see if our experience was a one-off or if all of the Sauerbraten is presented dry and chewy. 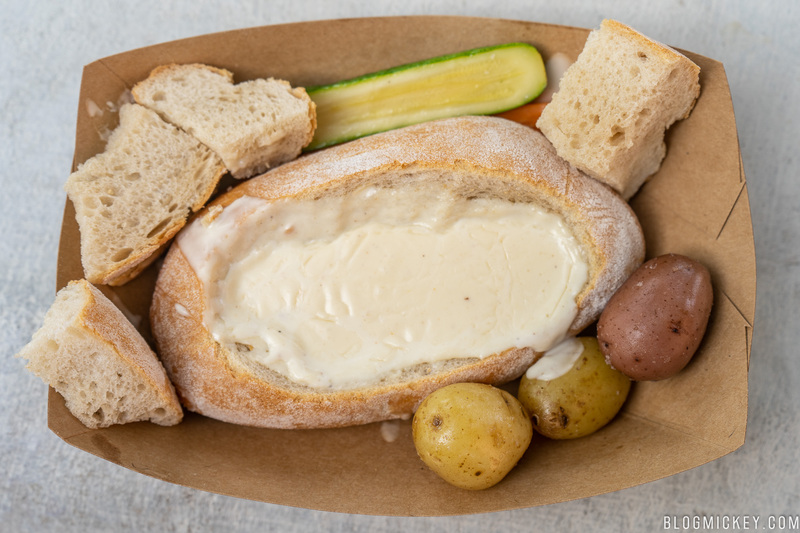 A simple cheese fondue is served in a bread bowl with fresh steamed baby vegetables and marble potatoes. This was a real winner. The cheese is really what makes the dish. It’s not a plastic, microwave cheese, but actually a robust offering. 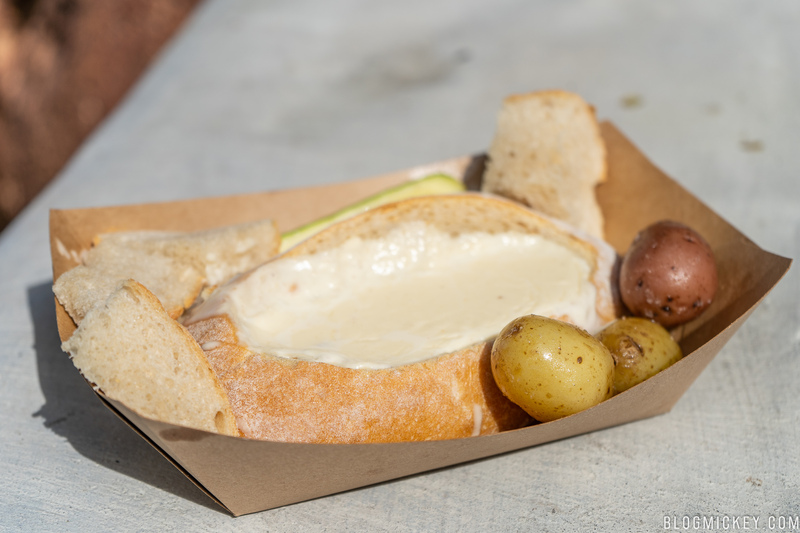 The bread was fresh and soft, which made it perfect for dipping. 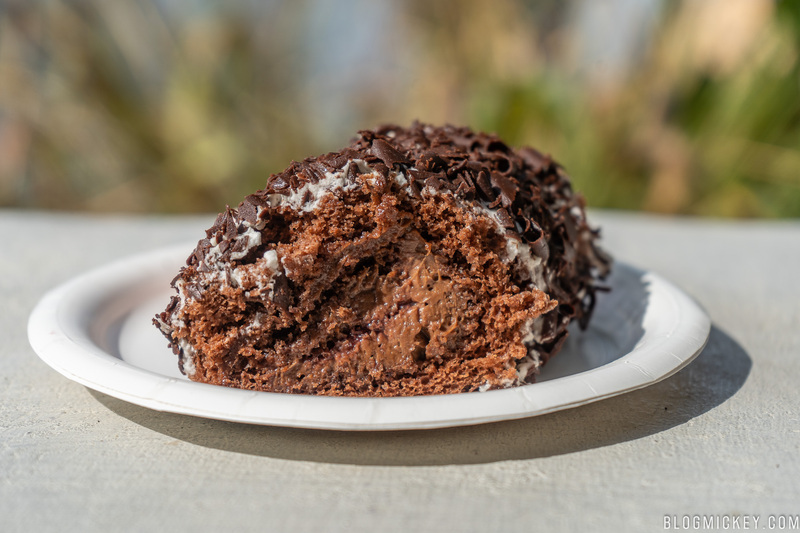 I could probably fill another blog post or two with all of the yule log type desserts we tried, but for now we’ll focus on the Black Forest Roulade. It was a nice, light dessert and a solid portion size. You’ll get hints of cherry throughout and the chocolate shavings are rich. Of all of the yule logs we tried, I would say this was in the top half, maybe top third of the offerings. If you only have the budget for a yule log or two, you can probably pass on this, but if you have more of a budget, we’d recommend giving this a try. 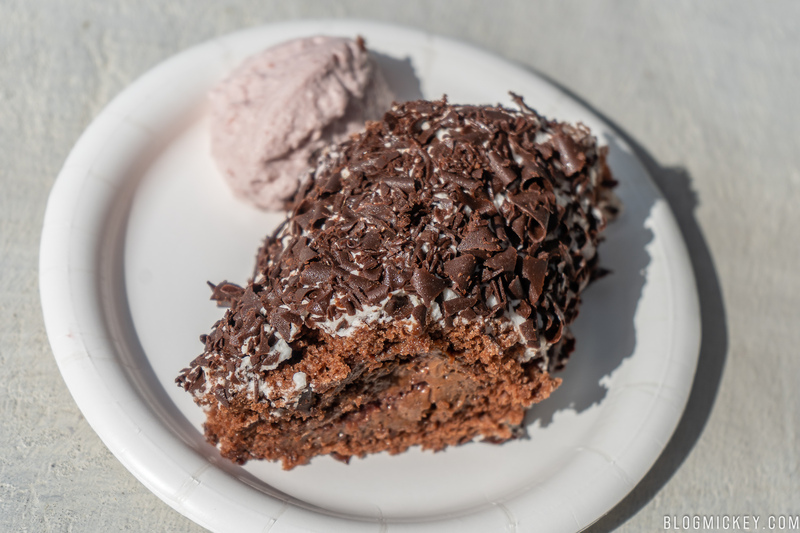 We encounter our second cookie of our holiday kitchen reviews here at the Bavaria Holiday Kitchen. My blanket statement of the Cookie Stroll cookies being underwhelming applies here as well. 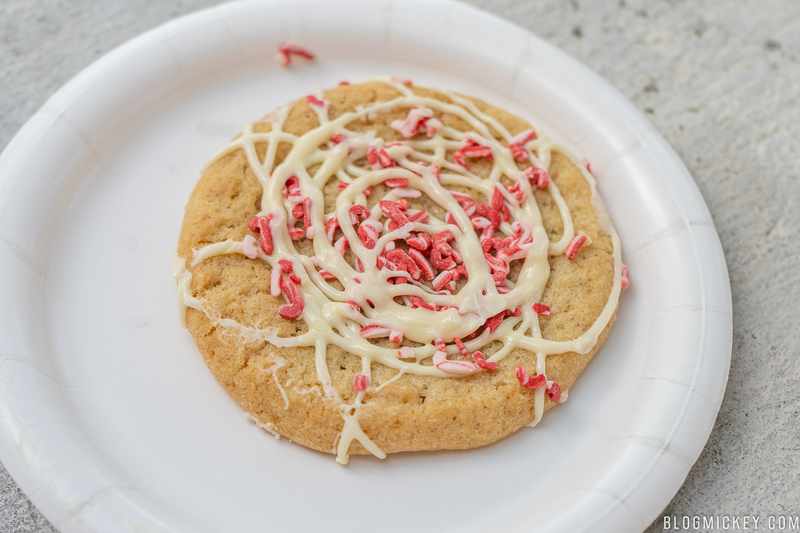 Unless you feel like the posting of a completed Cookie Stroll passport will increase your social media follower count by 4% or more, you can safely skip the stroll (and this cookie) altogether.